From the moment Colin Farrell checks in, informing the hotel receptionist that the sheepdog at his side is “my brother …he didn’t make it”, we realise we are decidedly not in familiar movie terrain. We have already been sideswiped by an unexpectedly brutal pre-title sequence, the meaning of which we hope will become clear. If it’s the deciphering of heavily laden symbolism we are after, the following two hours of The Lobster give us plenty to get our canines into. Farrell is told what limited facilities his single status allows him access to, asked what animal he would like to transform into should he not make it, and fitted with a chastity lock. His selection of lobster, on account of its longevity and fertility, is hailed as an insightful choice. He finds his table and chats uncomfortably with the other male diners, all intent on finding a suitable suitor from the array of equally awkward females. What follows is a mundane nightmare of stifling rigmarole, infringement of regulation, and strained propositions. All dialogue is stilted, removed, hyperreal, utterly devoid of emotion or warmth. It’s like the central tenet of unfiltered honesty mined for purely comedic purpose in Ricky Gervais’s The Invention of Lying (2009) taken to its disturbingly illogical extreme. The wonderfully eclectic cast is as unpredictable as the jarring dystopia we find ourselves trapped in. Farrell shines as the hopeless bachelor mustering his very last iota of free will in order to challenge his fate. Ashley Jensen, on the other hand, is resigned to hers, and is piteously downtrodden and despairing. Olivia Coleman is in fine form as the hotel matriarch, imperiously stern but equally happy to turn to song to oil the wheels of engagement at the painfully stiff dance events. And in a role diametrically opposed to her Bond girl turn in Spectre (2015), concurrently in cinemas, Lea Seydoux leads the faction of loner rebels, aided by a fantastically unassuming Michael Smiley. Among their number is the headstrong Rachel Weisz, to whom Farrell is eventually drawn, an attraction that will lead them both down the darkest of pathways. Head-spinningly odd initially, and lurking in the murky recesses between comedy and allegory, this is one grim fairy tale. Amusing, but disconcertingly so, unsettling, and often shocking, its central premise is impressively daring for a film boasting such a well-known cast. Benefitting from the restricting confines of the hotel setting, the first half strikes a uniquely original tone of surreal black comedy. When the action widens out into the woods in the second hour, the metaphors are extended, the tone darkens further, and the concept shows signs of creaking under its own portentous weight. 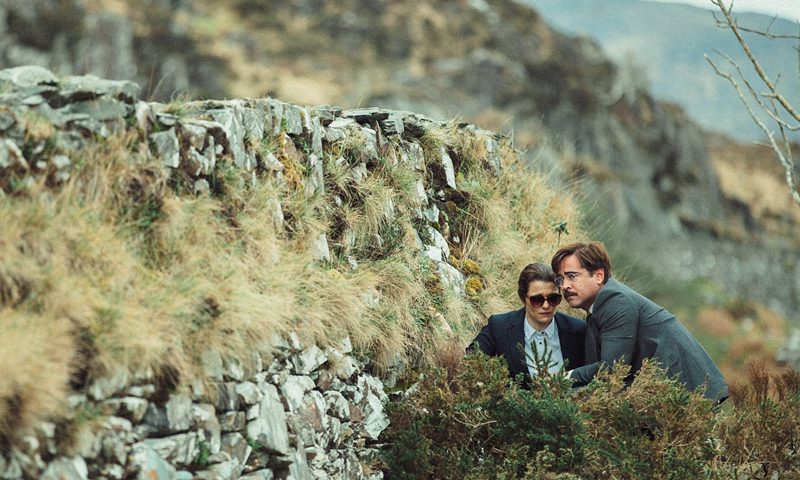 The Lobster examines the harmful nature of compromise by being thoroughly uncompromising. A parallel parable of modern love, set in a microcosm of bizarrely painful honesty, it asks how much we each hurt our true selves by coupling. Against the shallow backdrop of instant dating and swiped rejections on mobile apps, it’s a deep rumination on the potential self-harm of conjoining with another, and a tirade against society’s anti-singledom bias. If the contemporary world is designed for couples but we are all fundamentally alone, how much do we willingly damage ourselves to fit in? To fully digest this bewilderingly rich morality play may take some time upon leaving the cinema and reintegrating into ‘normal’ society. But with a brilliant and subtly ambiguous final scene, The Lobster’s bleak and incendiary interrogation of social pressure will stay with you. Whether you want it to or not.